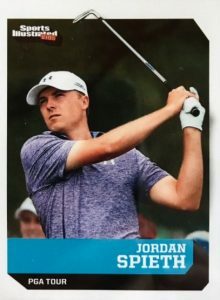 While it's hard to dispute his talent on the links, it is easy to question the number of available Jordan Spieth golf cards. The golfing phenom has plenty going for him but the cardboard is lacking, at least for now. 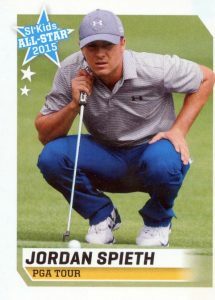 Because of the relative void, collectors must dig a little deeper for Jordan Spieth trading cards beyond what one might expect given the success of the young star. The list below documents the official cards out there for immediate hobby consumption. In addition to what is shown, there were promo releases from Beckett at the 2015 National and Titleist produced a limited set in 2016 that included Spieth. You may even come across slabbed cut signature cards for Spieth from Leaf under the Executive Collection banner. While the autograph is authenticated, these are collector-submitted creations and not pack-pulled. Be aware that much of what you see online, especially eBay, is nothing more than homemade customs. These are fine if you know that is what you are buying, but the cards have virtually no value. Shop for cards online using the listings below. Linked sets in the text go straight to detailed product profiles. Laying the strongest claim for the key Jordan Spieth rookie card to own, SI Kids gave collectors their first option for the golfing stud. Issued in perforated sheets of nine cards, Spieth shares the page with J.J. Watt, Jacob DeGrom and Stephen Curry, among others. 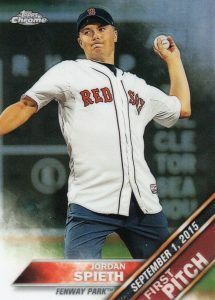 The card is found in the June 2015 edition of the magazine. Some might remember that Tiger Woods also had a similar circumstance where his first card came in Sports Illustrated for Kids. While the non-traditional format is not for everyone, there is still much in the way of value potential. Similarly, the Sports Illustrated for Kids magazine provided another choice in December of the same year. This time, the perforated card has an All-Star designation and is accompanied by a star-studded lineup including Aaron Rodgers and Lionel Messi. The earliest pack-pulled Jordan Spieth card came in Topps' flagship 2016 set. The Series 1 product celebrated notable First Pitch subjects from the prior year, Spieth included. The 2016 Topps Chrome Baseball Jordan Spieth edition applies the familiar chromium finish to the Series 1 image, and also offers several low-numbered Refractor parallels. These include Green (#/99), Orange (#/25), Red (#/5) and a one-of-one SuperFractor.